You skipped lunch, went to the gym, now you’re F-A-M-I-S-H-E-D. The list of hunger-striking scenarios is endless. We rarely keep ‘ready made’ items in the house, so grabbing something from a package and devouring it isn’t usually an option. These energy bites are lifesavers. Seriously! Not only are they relatively healthy, when comparing them to prepackaged bars or cookies, they actually curb hunger and give your body what it craves, nutrients and energy. Here’s the list of ingredients which I’m pretty sure you can agree is in the realm of good things to put in your body. Where we tip the scale a bit is chocolate chips. Now, feel free to skip those or use dried fruit, unsweetened coconut, or seeds instead. It’s still a winning combo of ingredients that offers a balance of real food with a touch of sweetness. It beats reaching for a chocolate bar as a snack any day, yet is even more satisfying. These tiny energy bites fuel your body when you’re on the go or between meals and your stomach is grumbling. They won’t kill your healthy eating plan and your kids will love ’em! You can make a batch and freeze them for up to 3 weeks. Just grab a couple, toss them in a baggie and take them with you on the road. Going, going, gone. Just 2 or 3 are enough to get you out of a hangry situation. These no-bake energy bites are full of flavour and yummy texture. The peanut butter and oatmeal pairing is nutty and tasty, with the addition of just the right sweetness from honey and chocolate chips. It’s snack heaven, I tell you. Mix peanut butter and honey in medium bowl until blended. Roll into 40 (1-inch) balls, using about 2 Tbsp. for each. Enjoy! Keep in fridge for up to 3 days. Store in freezer for up to 3 weeks. 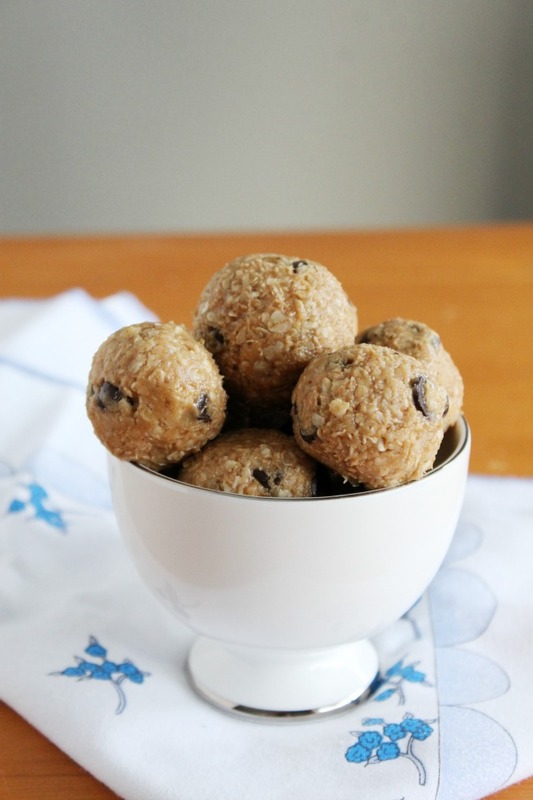 These /peanut-butter-oatmeal-chocolate-chip-energy-bites look really good and I like that they are so easy to make.They will be great for lunches!